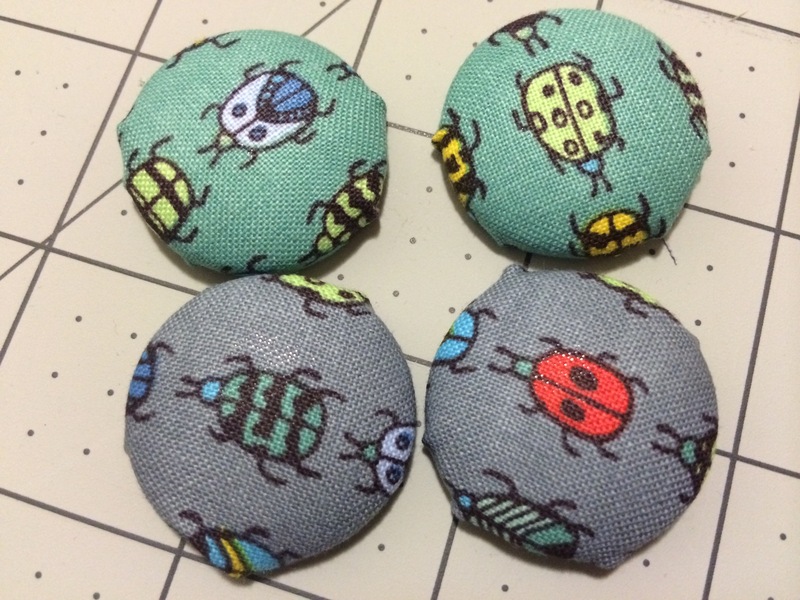 For the past few days I was working on a few little sewing projects from this adorable insect fabric. 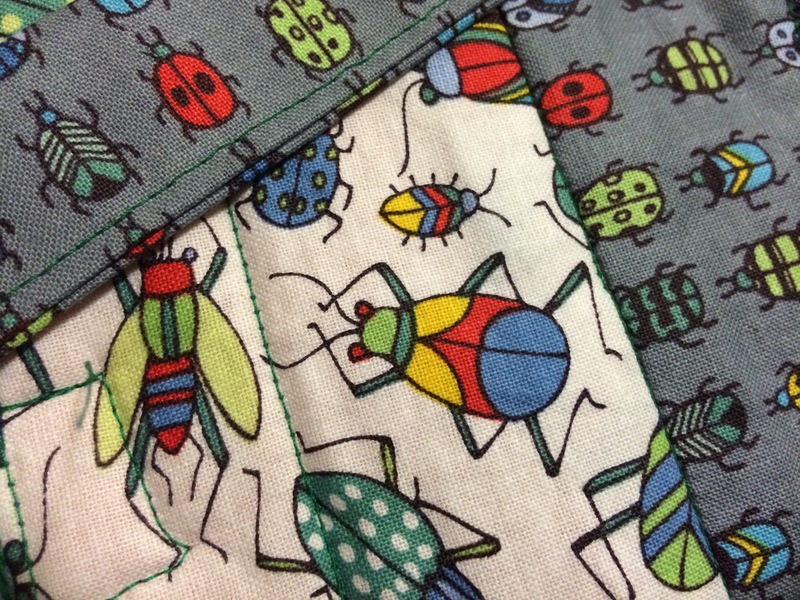 The friends whose kids these items were destined for are super into gardening, so I thought they’d like this fabric. 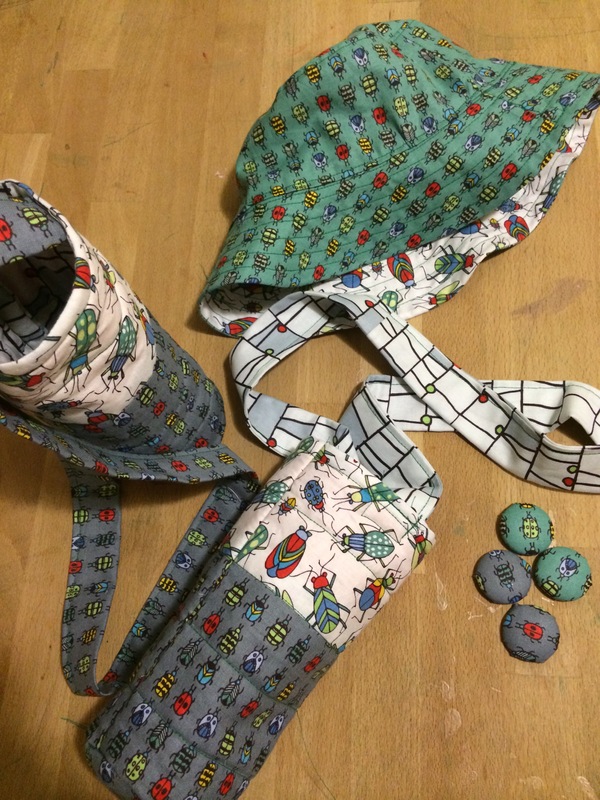 Reversible sun hat, water bottle carriers, ponytail holders. Ponytail holders-to-be! Alas, I didn’t have time to get rubber bands to complete the ponytail holders (yes, I wimped out due to rain + kids), so I’ll deliver them the next time I see these friends. The water bottle carrier is made from this tutorial: http://www.pinkchalkstudio.com/blog/2006/07/10/whiplash-challenge-water-bottle-carrier/ I have made mine using batting or fleece that I have on hand, rather than insulated batting. Also, I have opted to make a wide strap out of fabric instead of buying strap material. I just cut it 4-5 inches wide, make a wide strap as if I were sewing bias tape, measure it against a kid, and cut it to an appropriate length. 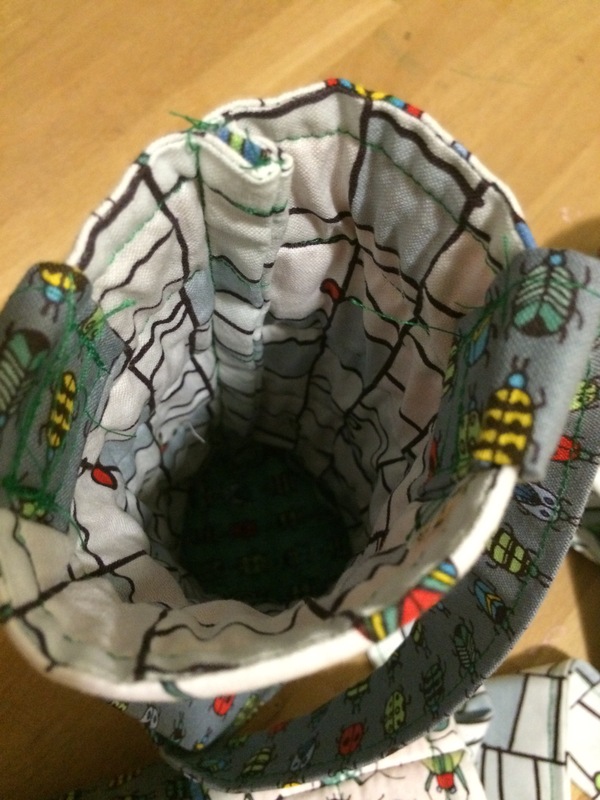 Then I just sew the end under before attaching it to the carrier. I love this tutorial (as you can tell by my making it 4 times now!). My only complaint with this is that it’s a tad narrow for our Kleen Kanteen or kids’ Nalgene bottles. They do fit, but the kids can’t get them in and out easily. I think that’s really ok though, because if we’re out hiking or walking, it’s a better idea just to lift it up and drink rather than take the bottle completely out every time. But I should try making them a tad wider next time to make it easier on the wee ones. As you can see, I sew back and forth a lot on where the straps are attached. I don’t want that area wearing out! 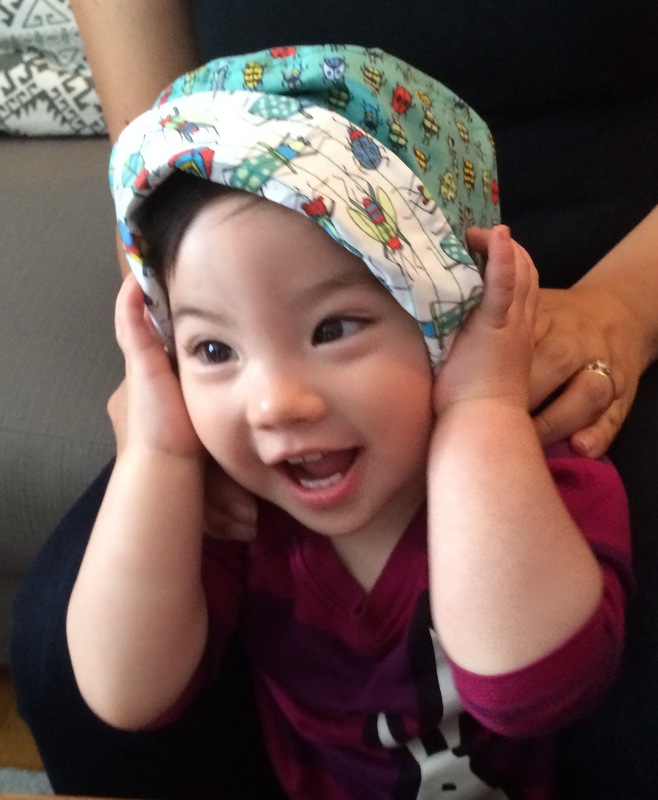 I didn’t get a photo of the water bottle carrier in action, so I’ll make up for it with cute-baby-in-hat photos!! Hat in action! 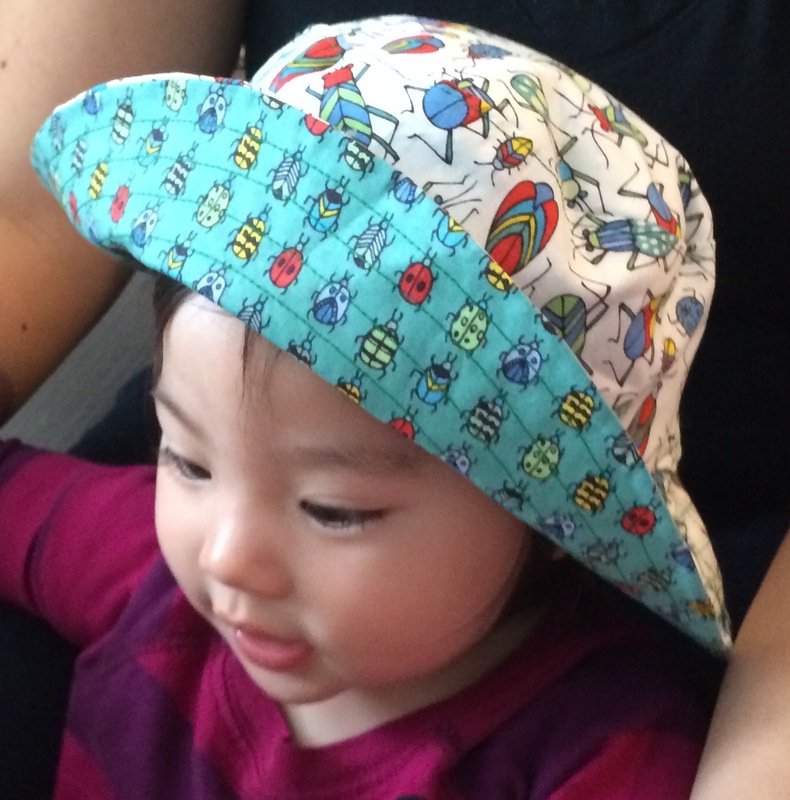 This is the Reversible Bucket Hat, a free sewing pattern found here: http://oliverands.com/free-patterns/reversible-bucket-hat/ I’ve made this hat at least 6 times now and can attest to its awesomeness. I’m not an advanced sewer by any means, but I’ve pulled it off reasonably well each time, and the results are so cute!!! I accidentally gave the Wee Boy’s dinosaur one to friends, so he needs a new one, too! 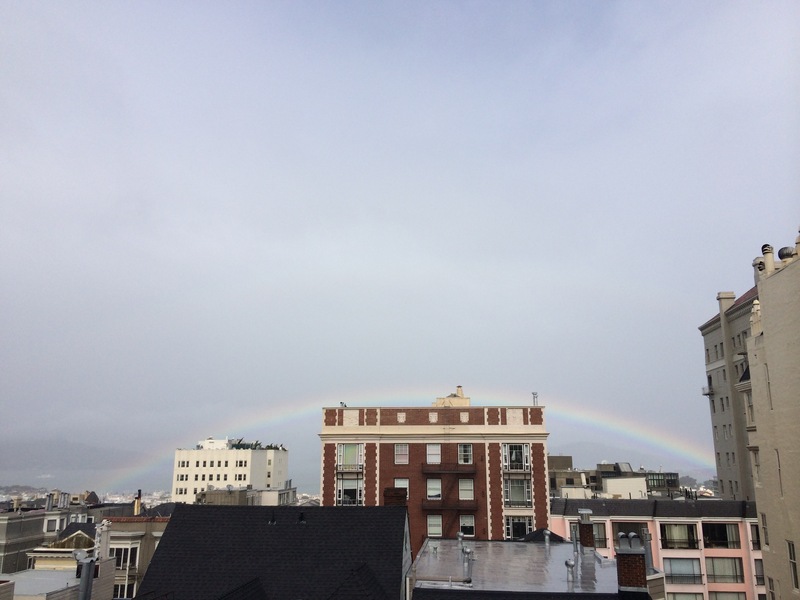 Oh, and a gratuitous rainbow photo from this morning! It’s been a stormy weekend, and we’ve spent a lot of time indoors. It was nice to have this brighten up our view for a bit. Splendid job! He is a cutie. Thanks!! She seemed to really like the hat! !